In a small bowl mix together the yogurt, ginger, tahini, sesame oil, honey, lemon juice, and salt. Heat ½ tablespoon of the olive oil in a large sauté pan over medium-high heat; add the garlic and chickpeas to the oil, then add the paprika. Cook the chickpeas and garlic until theyre lightly seared on the edges, tossing occasionally, about 5 minutes. Add the chickpea mixture to a small dish and set aside. Return to the pan and add the remaining olive oil. Once the oil is shimmering in the pan, toss in the zucchini and cook until lightly browned and tender, about 5 minutes. 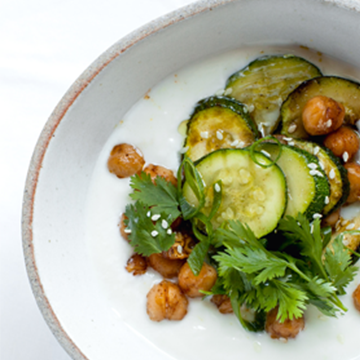 Spoon the prepared yogurt into snacking containers or a serving dish and top with the sautéed zucchini and chickpeas. 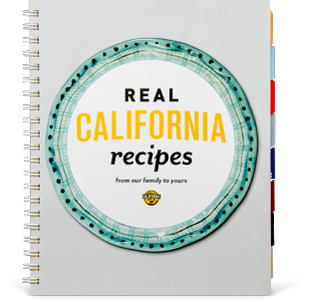 Garnish with sliced green onions, cilantro, and sesame seeds and serve immediately. Note: A wide sauté pan with lots of surface area will help in getting a nice sear on the vegetables and chickpeas, and it will make this savory yogurt bowl even more delicious.